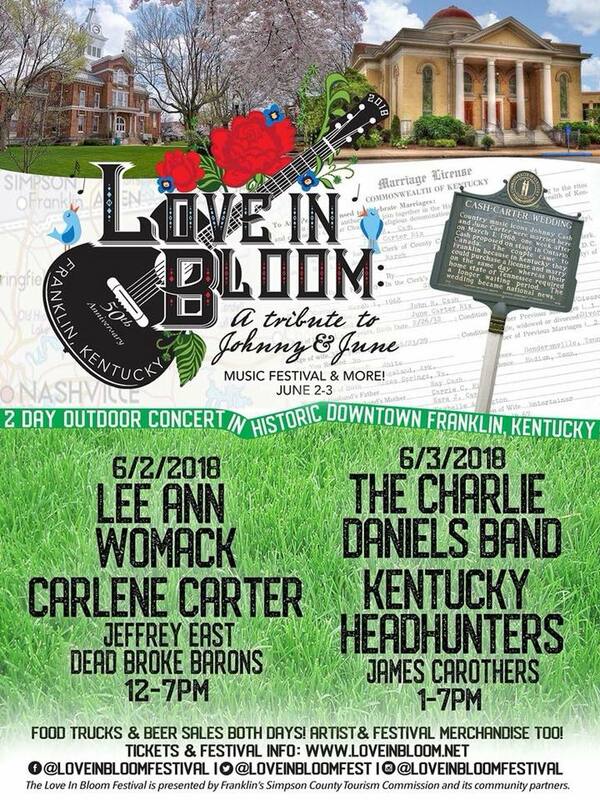 The lineup has been announced for the inaugural Love in Bloom Festival in Franklin, KY June 2-3, 2018. James will be playing a full-band show on Sunday, June 3rd at 1 PM, opening for the Kentucky Headhunters and the Charlie Daniels Band. The lineup on Saturday, June 2nd will feature Lee Ann Womack, Carlene Carter, Jeffrey East, and the Dead Broke Barons. Tickets are available now at www.loveinbloom.net. Johnny Cash and June Carter came to town on March 1, 1968 "in a fever" to marry and by the time they left that afternoon they were on the road to one of Country Music's most enduring marriages. Sadly, Johnny and June are no longer with us to celebrate their 50th anniversary but the community of Franklin, KY plans to celebrate this milestone event in their town's folklore. The highlight of the festival will be a two-day outdoor concert in the historic downtown. You can't get more country than this venue - it's one block from the courthouse, one block from the railroad, right in front of the sheriff's office and the jail, and just two blocks from the church where Johnny and June married. Older PostWATCH: Official Music Video for "Colt 45"